We are a legal entity at government level with a claim to recognition under the principle of legal international law. 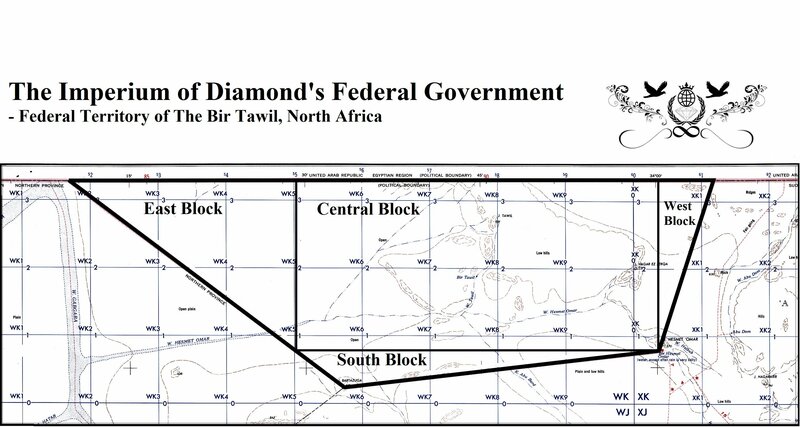 Government based on its own territories of the legal right of sovereignty in the territory of ID's Diamond Oasis North East Africa, Bir Tawil, also ID's Rockall Diamond North Atlantic, and the rights to develop its own sovereignty or civilization within the scope of many galaxies in the universe. Today, when claiming recognition under international law, we also have claims for judicial and political defense of territorial law in the territory of certain areas of South East Africa, the South Indian Ocean, the South Pacific, the Central Atlantic, the Caribbean, part of Antarctica, as well as the territories of the north- South America, as well as North America, Central Europe and South West Asia, a global federal distribution network. Our main ideological and constitutional goal is to unite the world in a friendly and democratic way, to remove the borders of all states and to create the unity of all nations and governments of the countries. A world that works together as the unity of all mankind. We support all cultures, the traditions of nations and all the rights of states, always freedom and human rights, always good successes for the peoples of our country! Every country in the world is truly welcome, and our goal is primarily friendship and the development of a common unity and a peaceful world full of nations. Our main policy principles and the vision of our development are intended to be fully respected by the principles of the UN Charter and above all Articles 1 and 2, as well as the recognition of the UNGA declarations and the overwhelming majority of International Humanitarian Law. Our goals are to establish our full links with the international majority of peace-keeping organizations, but also to extend the importance of international law to the benefit of nations, the cessation of conflicts and wars, the opening of possibilities for the full stabilization of the crime prevention policy, and the ultimate goal of achieving full freedom and human rights Of all nations. The legitimacy of our government is based on the principle of all important policy principles that are important for maintaining the name of the Legal Entity with the international rights of government and state. Our claims and legal status are recognized by international law, in accordance with the principles of the UN Charter, the UNGA Declaration, the Multilateral Parties and Organizations' Agreements on Forms of Recognition of a Political Subject, but above all the natural principles of political principles and universal political morals. 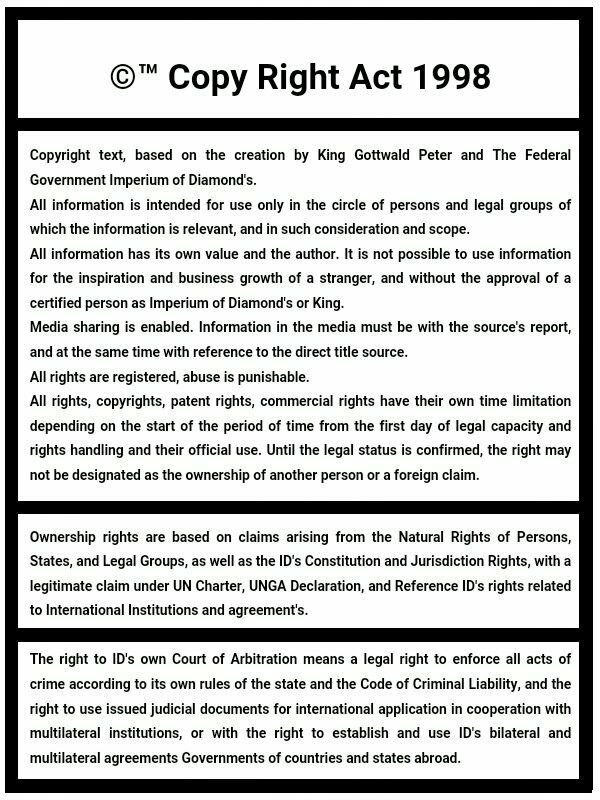 The Federal Government Imperium of Diamonds is a legal entity with all claims and rights of its own integrity and recognition. Our government is based on the legal right of constitution, jurisdiction, and ownership of economic values in the form of a register of the law of GDP defining the forces of the coin, today we also own a banknote and a payment system capable of financial communication between all the world banks and traders. Our GDP is at its highest in the world, our Active GDP is in the theory of € 300,000,000,000,000 in the DMD, twice the annual economy of the planet Earth, but our interest is still growing without barriers and at much higher horizons, Even in the strategies of permanent regulation of coins and maintaining the stability of the currency. We are is a multy economy, in the nature of the value of the registry law of our bonds, ID's GDP can be in the size of 845,000,000,000,000,000 × a multiple of the value of the Earth's Earth Economy in 2015, and in a multiple of the result every second every other year. The goal of building our country's business network dynamics is with a planned capacity of 25,000,000 business corporations for 10,000,000 people, and in a few years we are able to increase our capacities to much greater corporate network corporate success. The overall law of our country's corporate register is based on capacities over 7 500 000 000 000 000 000 000 (7,5 Triliard) business subject's, and our goal is still to support the development of foreign commercial banks and corporations on the territory of ID's government. Our activities are a defense of our legal rights, the growth of communication and the constant interaction of our policy and international interest are active among politicians, states and supranational organizations all over the world, America, Africa, Asia, we are also pleased to be able to build political relations with Australia, and our The aim is to build peaceful relations with the European states as well. Our interests are the development of common bilateral and multilateral relationships, or the development of a new global network of partnerships between all supranational associations and organizations. Our goal is to gain the position of a permanent member of the United Nations Security Council to support the immediate establishment of world peace, but also to prevent the monopoly activities of other UNSC members, full equivalence to all peoples, and firmly maintain a stable world security order. Today, our planet's Earth's rights on the Earth's planet reach a real claim register of up to 2,100,000,000 people, of which over 300,000,000 people are confirmed by international law as permanent citizens of our government. Our goal of population development is still destined for rapid construction, and we are able to achieve within a decade own population of 7,000,000,000 people. It is the same value as today's planet Earth. Our ability to build and create civilization development enables us to activate plans on other planets in the universe that are available to build population capacities in the 3,000,000,000,000,000,000,000 people dimension. Our government gives life to all people and races of an intelligent way of life and humanity, without racism and apartheid, and therefore also cloned individuals or, for example, androidic types of autonomous intelligence, as well as bio-robotic units capable of real activity with the human mind. This is a new step of mankind, and a quick rapprochement of our nation's future, but all of this today, because it is the loss of our lives to wait for the future. Our intelligence can be actively developed, and our foundation is above all the infinity, the existing ideology of the regime vision. Our capabilities are to create a dynamic power of industry automation, exemplifying and producing up to 10,000,000 luxury cars each month from one factory or, for example, annually cultivating up to 2,000,000,000 tomatoes on just 50x50 meters of soil, our standard capacity production and intelligence. Our main goals are to ensure a solid growth of our civilization, to secure our own position at the international level of policy, but it is also in our interests to support new and our own and cooperative world humanitarian projects to halt the famine that threatens up to 800,000,000 people every day, It is in the same interest in our goals to help and eliminate all current problems of today, catastrophic consequences, wars, diseases and viruses, illiteracy, other crisis factors of present and future times. We want to build a large and advanced nation, and we therefore also have sufficient intelligence and all necessary and legitimate rights, and we are therefore also looking for our partners for joint development and cooperation. Today, our main offer is to gain support and cooperation among traders, to gain our support among peoples and to start cooperating with all political parties from all over the world. We also offer cooperation for You, and we give You the open opportunity to join us and thus build our own alliances. Our goal is to ensure the full stabilization of the official function, and we are therefore looking for a partnership with other people and people who are capable of our common unity. It is in our interest to offer co-operation at the provisional office of the ID's government to create our global logistics and cooperation. We also support our cooperation with Attorneys around the world, and we are creating a project to fully stabilize our countries in strategic development activities at a global level and highly logistic building. We also offer support and cooperation for religious groups and churches that can support the steps of our joint growth and thus establish new visions of a common policy. Our interests are to create co-operation with all banks around the world, thereby building up the ability of global trade resources for the development of our countries. One of our main goals is also to organize cooperation with all I NGOs and NGOs that can participate in our joint activities and cooperation. Our goals are to unite the whole world, to build the greatest civilization in the history of all mankind, and to base the most important steps in human history, the unity of all nations, and the development of human civilizations throughout the universe. Slowly development of the Jurisdiction and right's. We publicly guarantee, our country is developed in peacefull affairs, loyality and respectability for right's of state, freedom of people and their right's for their own development, education and ownership of properties or live in moral and responsible society which is educated and developed only for peacefull level. Bid which can be a real ability of a monetary prize values in the stock at the level of your personal abilities work activity and voluntary act in your separate determination range formed along the system policy and the interest. Therefore, in the interest of minimum average acreage upon the financial applies to every individual in the worst situation and the failure of the Imperium of Diamond's to develop their own civilization economy, the average salary for one person on a budget one month, You can reach to gain success in 2000 Euro ten hours of work in case your work the whole month will be assessed on your profits dimension 77000 Euro. Therefore, your profit will be in the whole year work effort valued at 950,000 euros. Payment of the value of the check, the values of luxury and assets or other forms of investment resources and finance, according our agreement be your self termination. In the case of the ability of your activities, logistics and a good result which means ensuring the full function of government Imperium of Diamond's and the government's ability to expand its activities of an economic nature, the development of the structure of civilization according to the plans and projects of the government Imperium of Diamond's no illegal blocking and without problems by criminal groups opposition, in this case, your salary as a result of the strengthening of the growth of the economy and therefore the ability to budget funding and financial currency as your financial salary will be achieved by of responsible dimension merits and actual claims, for ratification by the value of work within the framework dimension economies Imperium of Diamond's and the Plan for development of GDP to the level at which the average citizen one month, can consume over 10,000,000,000.000 € as monthly paycheck working, 10,000,000,000.000 € it is now worth half as the GDP of the United States of America. Financial budgets ID's allow membership IAIC multiple 150 000 + 50 000 persons with professions Lawyer, Attorney, Business analyst and organizer, Security service by open space to create the largest entity of a political movement as a multi-dimensional country's government, and the number of which, according to today's International geographic movement is about the size of the actual state and nation. Our goal is activity on the level of international politics, business and globalistic. Our goal is to defend the legal rights of state and government of the Imperium's Diamond and ensure the development of civilization. Territories on The planet Earth & in The Universe, in distance's of the Doctilion LY's ! 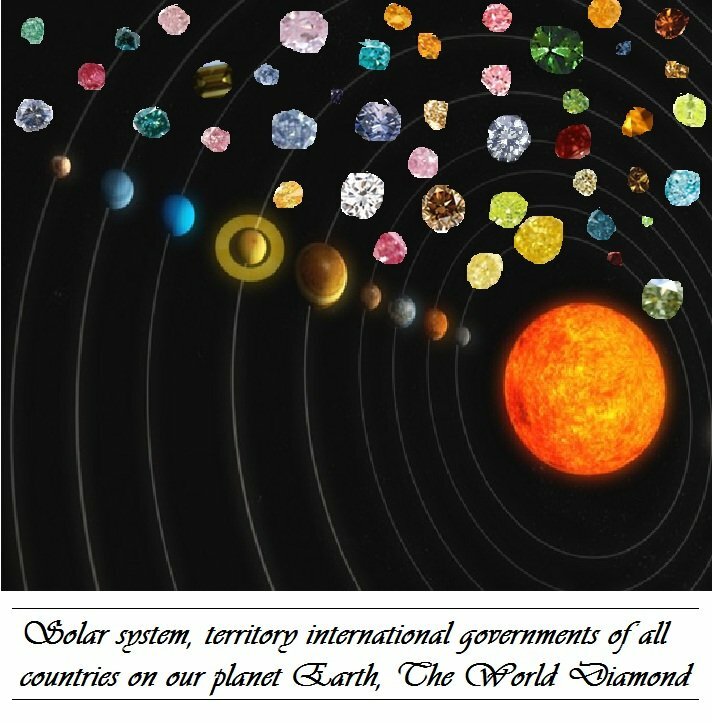 The Imperium of Diamond's, special territories accros the Galaxies amd Super Cluster's of Galaxies. Our interest for Business change of territories or agree between people and government's, or prosecuted our Judicial claim's and Right's in International Right way. Territories of The Imperium of Diamond's on planet Earth, according legal claim's for sovereignty or soveregnty according Agreement and Cooperation, Federalization. The Civilization around The Star. One City around The Solar system of The Star. Interactive Communication and Transport. The Planetary Civilization's and Technology Space Civilizational Center's. Every federal Government and Nation in The Federation of The Imperium of Diamond, have therefore full Right's for Coop-Developmemt of The New Stellar City civilization as a sovereign place of the federal state. One Civilization around single Star. 100 civilizational planet's, cosmic civilizational station's and ship's. One City. State financial currency IDs is based on power base GDP as IDFE. The STOX IDFE represents Imperium of Diamonds Federal Economy and establishes a register of all business values ​​and specialty property and investment opportunities available to the business area of ​​jurisdiction and the division as the Imperium of Diamonds State and Federal government public relations business forms. State financial currency IDs is the best basis for IDs International Financial currency. System strategy IDs Public and International Trade is based on the strategy of stabilization of state budgets and the ability to control the financial exchange rate against foreign currency strength coins in order to maintain constant contact with financial investors without risk or projected inflation and damage the value of the joint forces of assets between the owners of checks, coins and notes as own capital base. State IDs currency's value basis IDs of International Trade. Therefore, the number of issued coins and banknotes IDs National currency is not affecting the strength IDs International currency. IDs National currency can always be issued by the budget of state power and power consumption, depending on the scope of planned development budgets from internal raw material and civilizational sources possession Finance physical persons and any budgetary measure the number of coins and banknotes with restrictions under the ceiling of market and financial deflation. In this case, the number of any size IDs issued banknotes National currency is not in any way critical of IDs International currencies, which therefore owns much greater ability to function stable and dynamic budgets at the base stable value Division forms of IDs currency by the State budget, GDP IDFE. IDs International currency once again establishes the system of self-regulation, without the need to influence government budgets. IDs International currency's strength values ​​wedge IDs so that the State currencies just as the GDP of the state in turn affects the ability of the budget to the amount of coins IDs International currency. IDs International currency is therefore regulated by calculations and analyzes a steady source of investors and middlemen holders and budget strategy for the development of common markets. This reserve amount charged for deposit into their own ownership State for the ability to download a certain number of coins resulted in the stabilization forces for standardization level without a decline in value. The International currency strategy IDs is as well as the ability to exercise the right to issue new coins of which therefore causes impairment IDs International currency when its value will be too high and above the internationally level as possible. The ability of stabilizing financial regulation IDs International currency therefore causing the budget of coins to their international value is always more stable and pose no risk of loss of power, or changing the dimension values. The value of financial strength IDs International currency remains stable and pose no risk during the crisis state of the economy or risk bankruptcy resource and power values ​​from international trade markets Imperium of Diamonds State character, or when rapid control of the number of issued State coins because, for example, massive migration and immigration risks poverty and the decline of quality of life of the population, or lack of development resources and investors. Every owner and investor IDs International currency has therefore always greater certainty that their investments are kept on a stable surface without the risk of a much larger force posture stability success when comparing the competitiveness of foreign investment markets. IDs of International Financial Currency is thus simultaneously always open to all investors, and everyone can use it to exchange their property. 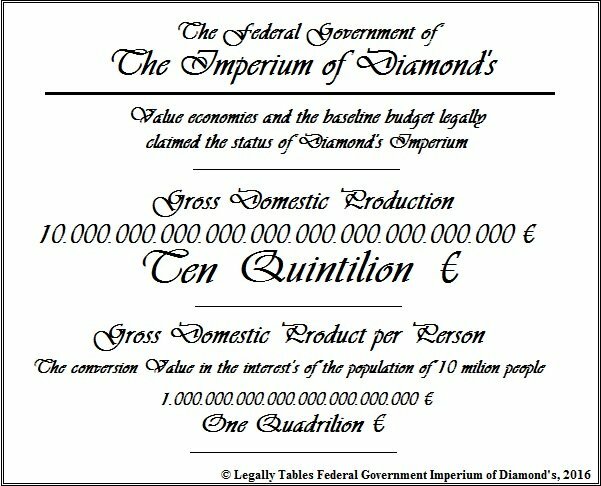 The federal government Imperium of Diamonds own interest in maintaining the financial strength of an International currency for the purpose stable investment value. IDs of International Currency is always stored on bank accounts and funds in banks Imperium of Diamonds, and other foreign institutions that are willing to adopt the form and value of the investment deposit. In case of bankruptcy on the strength of investment value IDs International currency, and rapid dimension, thus the value of coins and owned property used for the relationship as an active currency, but the new international payments will can be made a new financial currency (Active Currency) which will be the basis of the value of contract relationships and business relationships that mean facilitate the formation of business projects and implementation of economic development planning that will serve the strategic base and stabilize the economy with a focus on maintaining financial circuits capable calendar successful investment payments sufficient deposits for stabilization forces IDs International currency and to ensure investment security for all investment creditors. Cooperation be form of Common Strategicaly Managed act of business agreement, massive move. The federal government Imperium of Diamonds and also asking depositors, investors and the legal owners of the force values ​​IDs International currency, about the potential for business cooperation in the threat of bankruptcy forces IDs International financial currency, the owners were again ready for re-sale of coins through exchange for other foreign coins which will therefore always sufficient compensation and security forces to prevent the decline of your investment property. Federal Bank will buy back your Coins and Banknotes names IDs of International Trade, to drawing on the IDs of International markets and the possibility of using profits from joint trading sessions at stores IDs of actual currency as the currency is the basis of strategies to prevent bankruptcy and bankrupt financial strength of the currency. Common trade autonome form of profits from re-payment. The federal government Imperium of Diamonds therefore also suggests the possibility of multilateral cooperation between states for the purpose of joint agreements and strategies on transactions between parties of our agreement, and to prevent the decline of our currency in this manner. 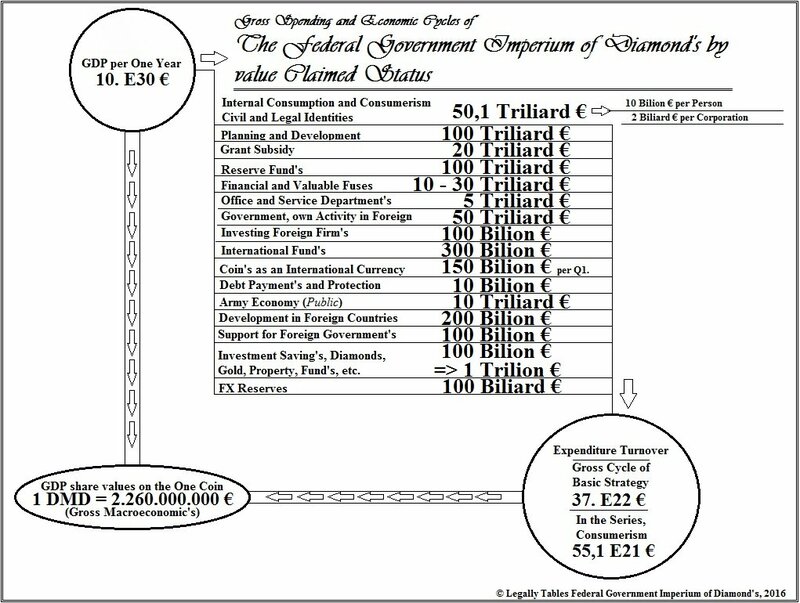 The federal government Imperium of Diamonds and simultaneously asks other states who are addicted to common financial and business relationship, which means a common economic stability, as well as the ability to support and to diplomacy and thus to respect the value of the investment of having a smaller residential groups in the state as the people who own investment assets in the form of IDs International currency, thus threatening to own property loss of such holders, resulting in the decline of their capital bases, meaning a decline of their market and the systematic weakening and your coins, so Imperium of Diamonds as a request to create a joint business cooperation for the use of strategic and certified not-losse investment deposits to the development of the market and developing estates in order to achieve stabilization IDs International currency which means the loss risk in the investment decline, and the use of such a risk for the possibility of creating a strategy for joint income that is eligible for the creation of the current aid for act significant power increase our diplomatic relations, again implying the possibility of our future success and support for the development of our economies and the stability of their strength. In the event of a crisis and the decline of strength IDs International currency is naturally open to the right for precautionary measures and investments IDs Government Finance currencies to another store on State Investment property Imperium of Diamonds, such as stocks and securities, real estate, art, systems of contractual obligations and other forms of independent investment property Imperium of Diamonds that mean the ability to maintain the strength of your investment assets in a stable form and ability to survive the financial crisis IDs International currencies in the period before a stabilization force IDs International currency and thus the ability to fully step of re-investment in ID's International currency, without any loss in value of financial weakness. However, if the situation Imperium of Diamonds International Trade will be at full bankruptcy, without a view of stabilizing the session after a period which is much longer than the period of time than the value of the investment deposit at the rate of the number of owners of depositors and creditors, holders of IDs International currency, it will be in this case acreage budget on individuals determine the amount of the investment value at a much longer period of power stabilization plan than property values ​​that are a natural source capable owners get to the same period of time, it will IDs International currency exchanged for the new currency which is based on the ratification of the value of the base of higher importance commercial power by a tenth, a hundred, or thousandths of zero order, and thus the redemption of financial capital higher currency for the purpose of stabilization and the ability to launch new act stable business sessions and stability financial currency that and its holder is again the ability of stable profit with a budget increase for the time dimension with significant growth capability for the investment of the substrate than at the growth of the values ​​of IDs of International Trade and investment in the economic downturn. Thus means that the loss of value and profits of investment is justified by all creditors currencies, while the possibility of using profits from the new series of stable investment dimension of network IDs International currency without a slump, and therefore the full gain. Investors from the previous cycle bankrupting currency because they own the right to use their registry, and so writing graphical power of their losses from investment deposits, and therefore transform used by units of state currencies to new cyclisation stable market that will attempt to trading strategies used for the ability to provide new profits investment dimension IDs International currency in order to ensure a return on the value of the loss of deposits and the strength of the forces of investment from the owners and users IDs International currencies. Transformation of the coin is therefore entitled to their own ability to ensure the stabilization possessions without time loss during development plan in investment rise to monetary strength for a certain period of time the same character. Every Investor and Owner of ID's International currency is therefore without any risc of Investment value lossing on price, or weaknes. The ID's Diamond Oasis North East Africa Bir Tawil Province Office Government of The Imperium of Diamond's plan's it's own development in industry's interest in the structure of Robotic's Industry, Galactic ship's and Industry of engineering, Chemical Industry, Transport Industry of transport equipment, Industrial Machinery & Mechatronic's, Recycling Raw Resources production & Industry, Weapon's and their production, Laboratory Activities for Industry & Industrial work and Engineering, Electronics Industry, Engineering from Bacteria and Organism's, Cyber Industry, Digital Industry, Biological and Genetic Engineering Industry and Industry in the form of Artificial Intelligence of Android's and Mechanical Organism, the Industry profit Laboratory Supplies and Raw Material's Mining, Rubber Industry and Processing, Pharmaceutical Industry, Oil Industry, Textile Industry, Paper Industry, Food Industry, Construction and Ceramic's, Scientific Industries, Glass Industry, Banking and Services, Recreation and Urban Services, Digital Industry, Music and Movie Industry, other special field's and Industrial option's. The Economy of The ID's Government, haven't problem in International Right's. Economy Right in Legal Basse ! All activities and plan's of The Corporatocracy be processed because in order to be successful presentation of project's and values before the World Bank, even before the International Monetary Fund and so even before all other bank's and financial institution's, so that the values of The Corporatocracy could be ratified together in order to establish common link's between these department's of The Corporatocracy. Through ratification will be confirmed value Corporatocracy League and that mean's the ability of a trusted application values on the International scene. Government of The Corporatocracy therefore of strategic corporate issue coin's, together with other values in the form of categorical coin's, check's and card's or certificates of a financial nature. Coin's and similar values issued by the Central Bank of The Corporatocracy can therefore be subsequently used as payment abroad and Internationally market's and shop's. ID's bilateral fund for every state in the world ! Significant plan's for production of the actual format Interactive Artificial Intelligence is the ability to calculate tall and activities. Android is all the same capabilities as a human. Plans for IT development, structure of civilization, society, and also the army. Separately, it is able to learn, acquire new contacts or live in society. Every Android can leverage technology thereby ensuring immortality for his mind as intelligence. Posibilities for development of Special system's of Location technologies, 3D Digital Map's. Imperium of Diamond's, special technologies for Handling of Planet's in distances of 500.000.000 LY per 1 hour.